Dr Kabir Sheikh MBBS, MSc, PhD, is a health systems researcher and policy analyst, with interests in health systems strengthening, governance and social equity in low and middle income countries. 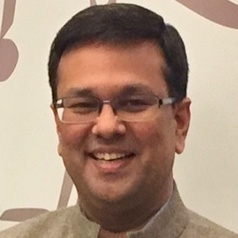 He is Joint Director for Research and Policy at the Public Health Foundation of India, and holds honorary positions at the University of Melbourne, the London School of Hygiene and Tropical Medicine, and BRAC University Dhaka. Dr Sheikh is the Board Chair of Health Systems Global (www.healthsystemsglobal.org), the first international membership organization for health systems research and knowledge translation. He is a member of the Global Health Group of the Medical Research Council UK, and a Member of the Lancet Commission on Migration and Health. He serves in multiple expert and advisory roles to the World Health Organization, the Government of India, the European Commission, UNICEF, the Wellcome Trust, USAID, DfID, the Bill & Melinda Gates Foundation, and universities and research groups worldwide.